Turn the pleasures of everyday life into extraordinary images with the Nikon 1 S1. 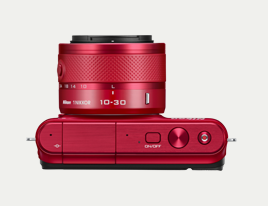 From its smart design that lets you shoot intuitively to its advanced technology that allows you to grow as a photographer, the Nikon 1 S1 is everything a great camera should be. When faced with a moving subject, rely on your Nikon 1's continuous shooting mode to deliver both high speed and sharp images. If the subject is in motion, the phase-detection AF works in tandem with continuous shooting mode, tracking the movement and keeping the subject in focus. 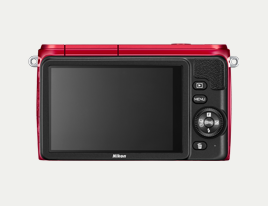 The superb GUI (Graphic User Interface) of the Nikon1 S1's LCD monitor allows you to operate on the screen through the rotating multi selector. The dual selector lets you choose from the five shooting modes quickly — it will display a simple explanation of each mode — then call up the feature menu for additional features related to the shooting mode you've selected. More choice. More color to life. Choose from an ample range of colors to suite your lifestyle and personality. 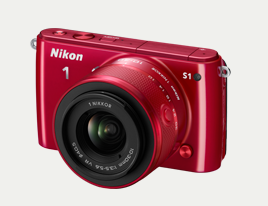 The Nikon 1 S1 body comes in five distinct colors of black, pink, red, white, and khaki. The colors of the lenses match the body when purchased in a kit so you can enjoy a cool, unified look.